Rising water filling up Santa Clara County's Anderson Reservoir, which was 99.3 percent full as of Wednesday, is expected to flow over the dam's spillway as a result of this week's impending storms. Bob Redell reports. Rising water filling up Santa Clara County's Anderson Reservoir, which was 99.3 percent full as of Wednesday, is expected to flow over the dam's spillway as a result of this week's impending storms. Unlike the potentially catastrophic situation with Lake Oroville's emergency spillway, the Anderson Reservoir's operational spillway is not at risk of failure, according to Santa Clara Valley Water District officials. 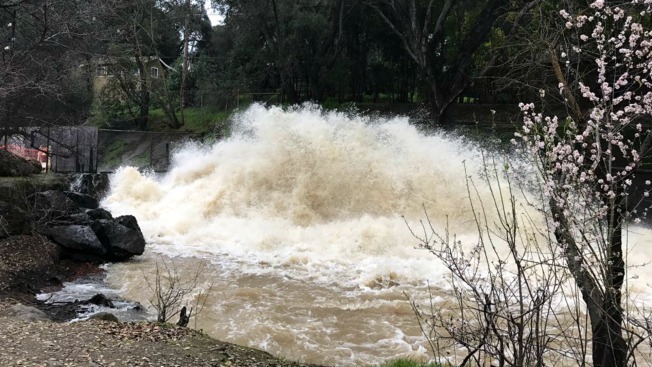 Despite that good news, officials in Santa Clara County are warning residents living along Coyote Creek and near Kelley Park to be on the lookout for potential flooding. Water officials for the past month have been releasing water from the reservoir at 400 cubic feet per second, but that rate is not fast enough to create enough room for the incoming rain. "It's going to be a bigger project than we initially thought and that's part of the process," Grimes said. "As you go through the design process, you learn more about how the structure of the dam was built, how it's compacted, what kind of materials are in the dam. To make sure that we build an appropriate project that's going to be safe long into the future, we're taking the time, the due diligence to design it correctly. Nobody is more eager than we are to get that project completed." That estimated completion date is years away, raising concerns about what would happen if a major earthquake struck the region before that time. Water district officials countered that fear by saying that the dam survived the Loma Prieta earthquake. In the meantime, officials will continue to release water from the reservoir until water levels drop below the 68 percent mark, according to water district board chair John L. Valera. That process could take four to nine weeks. Unfortunately for those concerned about California's recent drought, the water that is being released from the Anderson Reservoir is not being collected. "It's not water we can use," Grimes said last week. "There are just the physical realities. Unfortunately, we can't keep the reservoir full." The Anderson Dam is under the regulatory jurisdiction of the California Division of Safety of Dams and the Federal Energy Regulatory Commission. It's the largest of the 10 Santa Clara Valley Water District reservoirs and was named after a key founder of the district, Leroy Anderson. It is a long, deep natural gorge located three miles east of U.S. Highway 101 in Morgan Hill.